To make room for Richards on the 40-man roster, the Padres designated infielder Carlos Asuaje for assignment. Richards, 30, went 5-4 with a 3.66 ERA (31 ER, 76.1 IP), .222 opponents average and 10.26 SO/9.0 IP ratio (87 strikeouts) in 16 starts for the Los Angeles Angels last season. 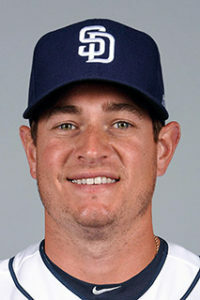 He allowed three earned runs-or-less in 14 of his 16 starts, including each of his last 10, before undergoing Tommy John surgery in July (Dr. Neal ElAttrache). Among Major League starters who threw at least 1,250 total pitches in 2018, Richards ranked first in curveball spin rate (3,252 RPM) and second in fastball spin rate (2,580 RPM) behind Houston’s Justin Verlander (2,618 RPM). He also finished tied for third among American League starters in average fastball velocity (95.8 mph) with Tampa Bay’s Blake Snell, trailing only New York’s Luis Severino (97.6) and Houston’s Gerrit Cole (96.5). Originally selected by the Angels in the first round (42nd overall) of the 2009 First-Year Player Draft out of the University of Oklahoma, Richards has a 45-38 career record with a 3.54 ERA (293 ER, 744.2 IP), 11.1 WAR (FanGraphs), 1.25 WHIP and 645 strikeouts in 170 games (115 starts). In 19 career games against National League opponents (12 starts), the Riverside. native owns a 1.52 ERA (15 ER, 88.2 IP). From 2014 through 2018, Richards posted the third-lowest ERA (3.15) among all qualifying AL starters behind Corey Kluber (2.85) and Chris Sale (2.85). He also ranked third in opponents average (.220) over that time frame, trailing Sale (.213) and Snell (.218).